It’s your big day and you want it to be as special to your guests as it is to you. Weddings today are more than just khana peena and naach gaana. Couples are coming up with fun ways to keep their loved ones entertained throughout their D-day. Not just for the guests, we suggest doing something hatke on your wedding for yourself too! Something that is not only fun but also gives you a bag full of memories to cherish later. Give chits to all guests with different songs written on them. Now let the music play. If the song played by the DJ is the same song that is on your chit, you are supposed to get up and dance. Make chits with the names of celebrities written on them. In separate chits write the names of their real-life partners. Distribute these chits among all the guests and now ask them to find their partners. The ones who find their partners first are the winners. Apart from a fun activity, this is also a great conversation starter and ice breaker for the guests. Time to test how much the couples know each other. Ask them (including the bride and groom) questions related to each other’s tastes, interests and favourites and match these to the answers given by their respective partners. You can also ask the men what their wives are wearing! It will be fun to find out how many of them give the right answers. Needless to say, the one who gets maximum answers correct about their partner gets awarded. The only person who is the most sought-after at any wedding (after the bride and groom) is the DJ wale babu. With everyone spamming him to play their choice of songs, the whole scenario can get confusing. A DJ request box will make things easier by ensuring that everyone gets a chance to groove on their favourite song at your wedding. Instead of serving food and drinks the conventional way, go for something unique. How about serving chaats in martini glasses? Your guests will definitely love this. Apart from the regular food and snacks counters, have a special counter for popcorns where guests can choose from a variety of flavours. Also, give the bar a pass, and use water coolers to serve cocktails. For a more interesting twist, serve vodka flavoured chuskis in a food cart. We are also totally in favour of making the guests DIY their food. Let them pick up different sprinkles and toppings for their ice cream. A DIY candy bar or dessert bar is another cool idea. Huge sunglasses and funny wigs are so basic. Up the level of quirk in your wedding pictures by having unique photo booths at the venue. A giant polaroid photo booth or one with interesting themes inspired from TV series can add to the fun factor. This is where you and your guests will have most of your candid pictures at the wedding! This idea came to us courtesy Sonam Kapoor. 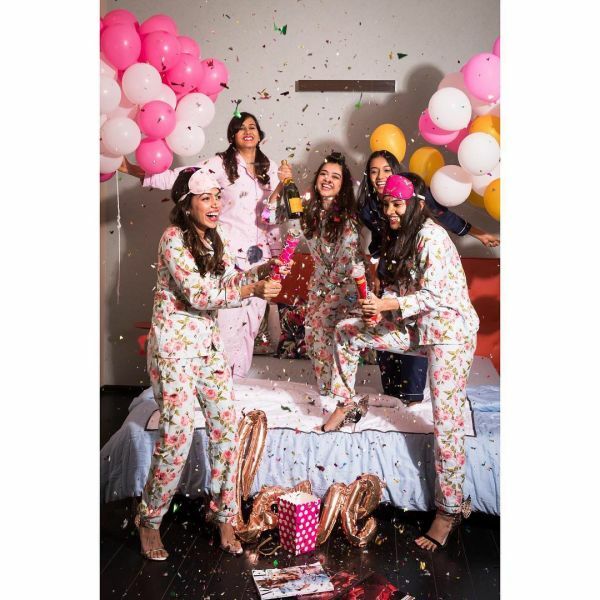 She gave all her guests pretty custom-made juttis from Fizzy Goblet as mehendi giveaways and we couldn't help but swoon over them. Depending upon your budget, you can either get juttis or anything that you think your guests will like. These gifts will remind them of the happy times they had at your wedding by serving as a wedding memoir. And they will also thank you for the cute surprise. The latest buzz among couples getting married is marryoke, where the bride and groom lip-sync to some romantic numbers and star in their very own pop video. Get large display screens for the lyrics and the couple (and the guests) can mime the popular hits. To add a twist to the karaoke night, you can follow this up with an awards show and award guests with funny titles based on their performance in the karaoke. A late night snack party MUST be a part of your evening entertainment. After all the dancing and boozing, your guests will be so exhausted that they will thank you if you roll in some snacks before the pheras. Good food is all that is needed to re-energize the guests after the fun night. Make sure to have a food truck with choices that make everyone happy. We suggest some comfort foods like tacos, mac and cheese, donuts, or french fries. 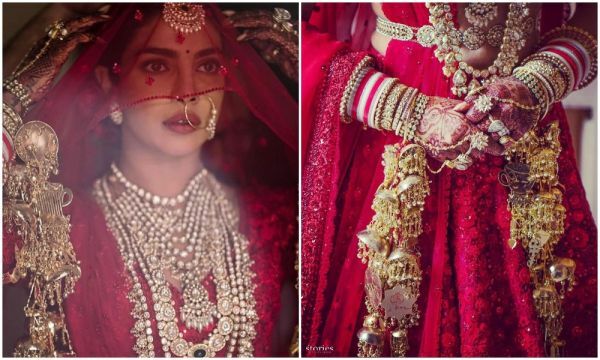 Again, courtesy our stunners, Sonam Kapoor and Priyanka Chopra, brides are now going for customised mangalsutras and kaleeras for their wedding. 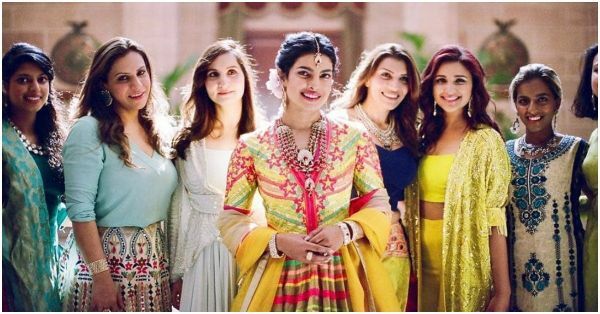 While Sonam got customised peacock kaleeras from designer Mrinalini Chandra, PeeCee had a symbol from Greece where Nick proposed her and also Nick and her favourite character from Beauty and the Beast hanging on her kaleeras. Sonam also wore a customised mangalsutra with the sun signs of the couple embellished on it! Take inspiration from these two celebrity brides, leave the cliché behind, and opt for customised accessories for your wedding. Desi weddings are not events but festivals, so why not celebrate them like one?! 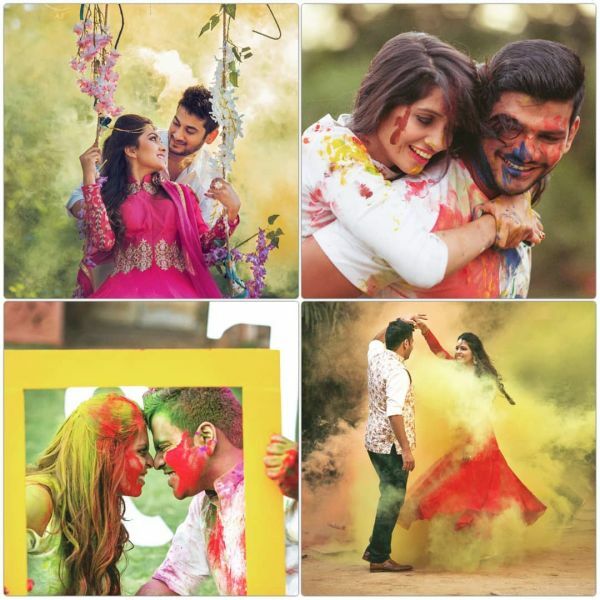 Add colours to your special day by kickstarting your wedding festivities with a holi party. With water balloons and lots of colours you can set the mood for a Hoil-themed Haldi party. If you are not sure about the colours and water, go for phoolon ki holi, or brij ki holi as it is popularly called. It is a lot more fun than it sounds. Just imagine - flowers being sprinkled on you and your partner by all your loved ones as you celebrate the beginning of your new journey. The whole scene looks nothing less than a legit festival. Plus, it gives oodles of great pictures. A melange of Moroccan and Arabian decor, sheeshas, and a live singer playing some soulful ghazals will give your guests an unforgettable evening. Anybody crushing over Sanam Puri or Akhil Sachdeva here? A jugalbandi is another great option. It can be between two musicians or between a musician and the DJ. This musical night is perfect for your cocktail and sangeet. 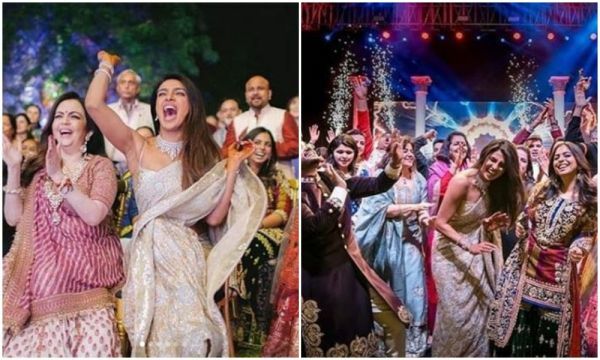 Like our favourites, Priyanka and Nick, you can have a friendly and fun-filled cricket match on the mehendi day..or any other sport that the majority supports! It can be ladkewale vs the ladkiwale or girls vs boys. The winning team can get the losing team to do something fun like prepare an impromptu dance performance! It'll be so much fun and nothing can be a better ice breaker than this. It’s all in the details! You can have custom made badges for all your cousins and friends. Be it a 'Bride Tribe' badge or a 'Ladkiwale' badge, get your squad to wear something that makes them stand out from the rest. Take your guests by surprise when they least expect it- perhaps when everybody is getting a little emotional. Make it personal for the bride and groom. You can do this by choosing their favourite song or a song that brings back happy memories to them. Though the choreography shouldn’t look like an audition for a dance show, it also shouldn’t give the impression that the group is unprepared. Get everyone who is participating in the flash mob rehearse the steps a thousand times before the D-day. Another great option to keep your guests (especially those who believe in the stars) entertained is a tarot card session. You can also consider palmistry, astrology and face reading. The guests can go and sit with the astrologer and get interesting insights about their lives. If not the wedding, consider this for your mehendi day. Dating panipuri is one of those few gourmet experiences in life where we don’t mind a dribble leaking down our chins in public. No Indian wedding is complete without a panipuri thela along the buffet counter. 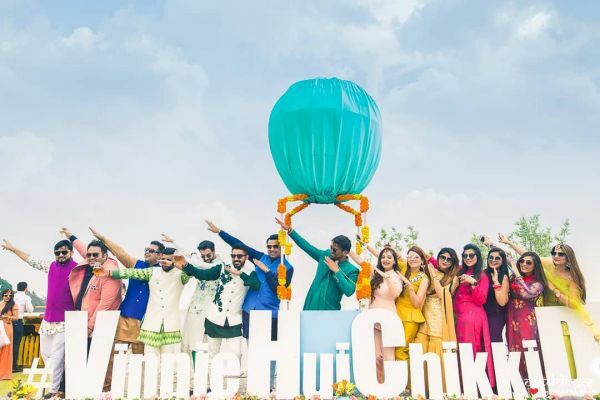 To make things spicier in your wedding, organise a panipuri eating competition for all the chaat lovers out there and see how much fun it gets. Another fun idea for your wedding is having your guests write a cute little message for the couple on note cards or signing stones and place them in a box designed specially for this purpose. The messages can be wedding wishes, marriage advice, cute compliments, throwbacks or anything that the couple will find pleasantly sweet. Everybody likes gifts and when it comes to the mehendi day, there’s more than just colourful bangles that you can gift your guests. Here are a few gift ideas that your guests will appreciate. 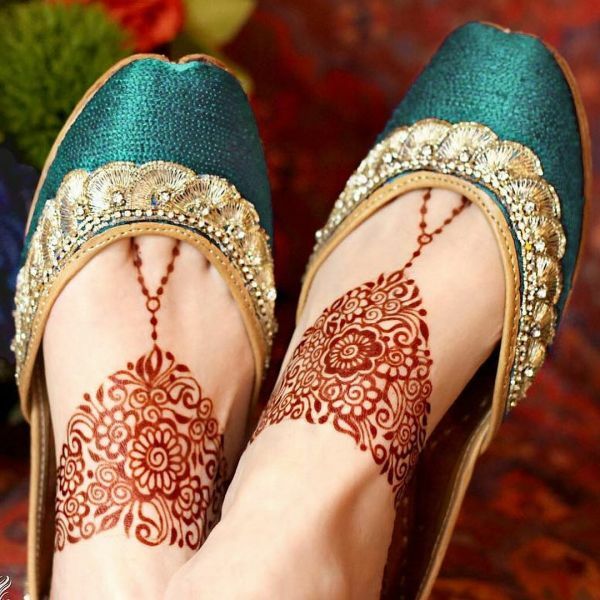 With your hands all decked up, why should your feet feel left out? Juttis are a super trendy gift option for your bridesmaids. You can have a vendor set up a small counter at your mehendi venue to ensure all your girls secure the perfect size. POPxo Recommends: Fizzy Goblet for quirky handcrafted juttis. Floral or gota haath phools, maang tikas, and earrings are not just beautiful but also the only piece of accessory your girls need to adorn with their mehendi outfits. For the fashionistas in your gang, choose a gift that is a blend of luxury and timelessness. A pashmina shawl is a great accessory that reflects both. POPxo Recommends: Kashmir Box for pure pashminas. Pamper your girls with a gift box full of beauty products. Choose organic face washes, ubtans and scrubs that come in a travel-friendly packaging. Keep them cheerful by offering them sweet little treats throughout the wedding. It can be anything from candies and muffins to cupcakes and chocolates. Even kids deserve a sweet surprise at your wedding, don’t they? Have a special art and craft room for the kids, where they can write, draw, colour or do anything that keeps them busy and occupied. Have all the necessary things handy- like white papers, crayons, colouring books, and pencils and the kids are good to go. A professional entertainer, like a storyteller or a magician, will also keep the kids happy and entertained while the adults are busy participating in the wedding celebrations. Make room for a Kids Only section at the venue where the little ones can play hide and seek, video games, or simply run. This is a great way to keep the kids distracted and busy while the grown-ups enjoy a glass of champagne. Sounds crazy but a game of tug of war can add the fun factor to any wedding. Everyone knows how to play tug of war, right? The wedding edition, however, is slightly different. Here, the bride and groom are at stake! With the couple in the centre, Team Bride and Team Groom try their best to pull them to their respective sides. The team that succeeds, wins! Winners also have the leverage to make the losing team do anything. How about making them fill your glasses throughout the party?